This book is published as TAN. The glossy covered re-print is by St. Benedict Press, which bought TAN Publishing. The non-glossy covered book is an original TAN re-print. It is also available through Refuge of Sinners Publishing. Plain blue cover. 520 pages. Soft cover. Imprimatur: January 26, 1956. This book was originally published in 1955 by the author. This book is the result of a life-long study of St. John the Apostle's Book of the Apocalypse. Taking symbolism from the Old Testament, as interpreted by Church Fathers, Fr. Kramer is able to decipher the meaning of this prophetical book relating to our times. The exile of both Pope Gregories (XVII and XVIII) is here, as is the battle for the restoration of the Chair of St. Peter to the One True Pope! This book is not to be overlooked! 78 pages. Author: André, Marquis de La Franquerie. This is the authoritative text on the Church-approved seer, mystic, and victim soul, Marie-Julie Jahenny. The first part of the book introduces us to Marie-Julie, whose visions began at 19 years of age and continued until her death at 91 yeras of age. 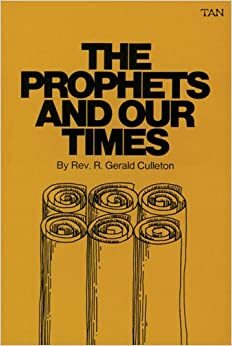 The rest of the book gives us the most important of the prophecies regarding these times that we are living through today and the coming Chastisement known as the 3 Days of Darkness. Recommended reading. 303 pages.This book is available for purchase through our online store (see upper menu bar). A subject index is sent digitally to you so that you can find specific subjects more easily and compare the prophecies. This book is the most comprehensive collection of the more important prophecies put into an English translation. It is an excellent reference book on what is to come. 235 pages. Soft cover. Published by TAN Publishers, 1974. Originally published by the author, 1941. Imprimatur: 1941. "Thou art the Angelic Pastor of Rome, O benevolent doctor, O most indulgent father -- Hail, Gregory XVII, most Holy Father, necessary shepherd" [p. 174, a prophecy of the Monk of Padua (1740)]. "Thanks to an excellent work of the sun, the earth has nourished the devoted flock of a most holy shepherd -- our very Holy Father Gregory XVIII, a priest altogether admirable." [p. 175, ibid].